MUFF WIGGLER :: View topic - COCOQUANTUS 2 "GETTING STARTED MANUAL"
COCOQUANTUS 2 "GETTING STARTED MANUAL"
Here's a little compendium for those who are approaching the Cocoquantus for the first time, these informations are precious material collected around this amazing subforum and after several months of intensive use of one of the coolest electronic musical instruments ever made. I'm not going to cover all the parts of the instruments, this guide is intended to be a "getting started manual", and frankly some parts still puzzle me, I'm going to put some links of interesting readings and insight at the bottom of the page. Look at this infographic, credits goes to the uber wigglers spacelooper and chorus7, hope it's fine for you to repost it here. The Cocoquantus is made by 4 parts as you can see, in the center you have an array of oscillators and circuits we are going to call QUANTUSSY, the QUANTUSSY is perfect for modulating your recorded material, then you have a left COCO and a right COCO which let's say are our "loopers" and then on the very left of the unit you have an input section including XLR mic IN and a 1/8" IN for piezo mics equipped with an ENVELOPE FOLLOWER OUT (orange). 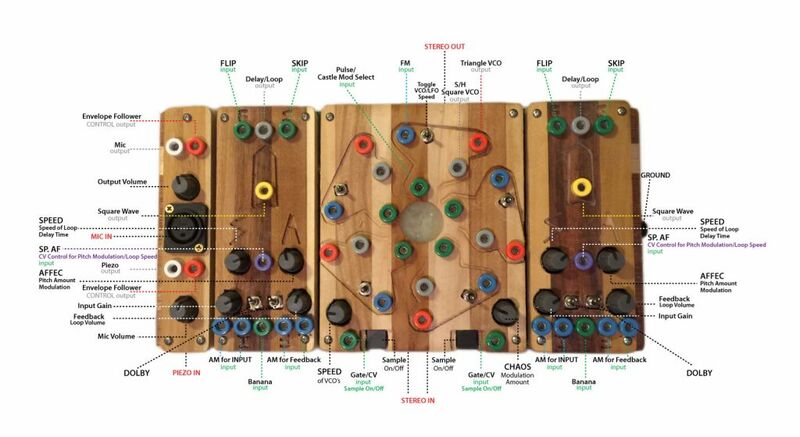 The toggle switches on the QUANTUSSY are three ways switches, center position is audio speed, pointing inwards the VCOs go LFOs, pointing outwards VCO behave somewhere between audio/LFO range (for lack of better technical term). the two jacks in the center of the front of the unit are both stereo jacks, left channel of your stereo instrument will be sent to the left Coco, right channel to the right Coco. If you use a mono jack both inputs will send your audio only to the left Coco. Tip: want to send two mono instruments at the same time one to the left and one to the right? Input one instrument into one of the two stereo inputs, you will hear it on the left COCO, input the other one into the PIEZO IN (which is mono) and with a banana cable send it from the white banana jack to the green banana input of the right COCO. If your use your classic "red and white Y stereo cable", left COCO goes to the right channel of your mixer/whatever, right COCO goes to the left channel, I usually invert the jacks on my mixer to have it "right". Also, I always put a stereo compressor between my Cocoquantus and my mixer as it's sometimes an untamable beast, beware the FEEDBACK volume if you pass 12 o'clock. your buffer is now clean. in up position they behave as suitable Dolby filters (but I'm still trying to understand the upper positon, sorry, I will update when figuring out), the left one for the IN, the right one for the FEEDBACK. - if you switch both down you are inputting "silence" basically "gating" your feedback loop with your audio source, try this with a tight drum machine to get the idea. The "click" is audible on purpose so you can get an idea: it must be "loud and tight", I used a rim-shot amplified at +24, pitched +33 to shorten it, I've also succesfuly used a similar sample from my RYTM, a fellow wiggler make it works with a TR606. If you put your clock from the PIEZO IN and your instrument into the front STEREO IN you should be able to loop real time on the beat, never tried this out tho. That's all I know for now folks, hope it's helpful, have fun with your COCO! Thanks to all the amazing wigglers sharing their knowledge in this forum, and please let me know if updates are needed or mistake were made and I'll update the OP. Nice work arnoux! I was just pointing a new Wiggler in the direction of the old thread and thought it was a little buried so this is perfect! Thanks from me too, I have a lot of this info collected on littke papers, especially cleaning the buffers. Now it's a full document, great! Thank you, hope it's helpful for somebody..
Will add some new sections from time to time.. Damn reading this doesn't ease my cocoquantus lust! Another vote to sticky this thread..
Best introduction I've found to this beast! Can anyone tell me the exact size dimensions of the Cocoquantus? I'm planning out a rig with limited space to work with and want to be certain it will fit before purchasing. Thanks! Very helpful since i've got one since yesterday (Patchpoint Berlin). Sorry this wasn't obvious to me, what does FLIP and SKIP do? Skip moves about within the sampled audio. Flip switches beyond forward and reverse playback of the sample. The modulation of both at the same time produces wild results. Question: when inserting the quantussy oscillators into the coco banana inputs does y'all get large crackles audio as the banana jack is plugging in. By large I mean louder by a log scale, similar to the sound of an input jack crackling on a guitar. I put my coco down for a bit and just came back to it, can't remember if it used to do this or not. plug into the input first does it still do that? It's new. All the new ones have it. It does seem like turning the volume down helps, strangely the crackles still happen when I plug the piezo/clean banana out into the banana in. It's not too bothersome, just wondered if it happens on other people's machines. does it happen regardless of the source? Can anyone tell me the exact size dimensions of the Cocoquantus? I'm planning out a rig with limited space to work with and want to be certain it will fit before purchasing. Thanks! I'd be glad to know the dimensions of the beast. There are many connections on the front, back and ground, so space will also depend on cable sizes. Exactly, these eat a lot of space. Would be nice to have my PB2 directly in front of the CQ2, but there are always a few cemtimeters needed for the in's and out's.